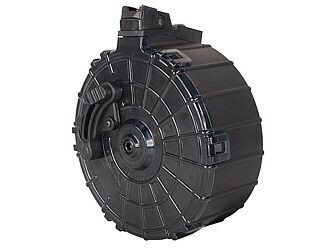 The ProMag Saiga 12 20-round drum magazine is constructed of high strength carbon fiber reinforced polymer. This drum will only work with 12 gauge 2-3/4" shells. The drum features steel inserts in the feed lips for long-term durability, and reliable operation. The loading lever on the back of the drum makes filling this 20-round drum magazine easy.